There are some interesting discussions in the forum, kicked off by CyGuy, about the precise nature of the “feature update deferral” setting in Win10’s Updates Advanced Options. If you’re on 1703 (my production machines are all on 1703) and you want to move to 1803, it’s easy – just set the feature update deferral to 0 days, and run through Windows Update once. As long as you do that before 1809 is released, you’ll end up on 1803. But zero2dash has conducted some experiments with VMs that make me wonder if it’s possible to move from 1703 to 1709 by setting the “feature update deferral” to a number larger than 48 but less than 221 (give or take a day or two, as time marches on). Can any of you confirm? I have a copy of 1709 stuck on a USB stick and can upgrade from 1703 to 1709 that way, if worse comes to worst. But it’d be a whole lot easier to just set “feature update deferral” to 200 days and let Windows have its way. On the 17th, Microsoft re-released eight patches in the Update Catalog. They cover Win10 1803, 1709, and Server 2016. As best I can tell, there have been no changes to the patches themselves, so it’s likely these are “metadata” changes — adjustments to the installation logic for the patches. The KB articles now have correct build numbers listed, by the way. But only at the top of each KB article. The slider on the left still has the incorrect build numbers. For example, the latest Win10 1803 patch is listed at the top as build 17134.167, while on the left index it’s shown as 17134.166. Per a tweet from Paul Thurrott, the Download Windows 10 site is still offering version 1709. I just checked and it’s still there. If you think you may need a copy of 1709 in the future, hop over there and download an official ISO. Whatever you do, don’t burn it on a CD and then sell the CD as if it were a “genuine” 1709 CD. Update: as mentioned in the comments, the page is now offering version 1803. Sic transit gloria. Windows 10 1709 got another update today in the form of KB4093105. Based on my read I think it’s fixing the pen issue that was introduced. That one where modern apps come back after upgrading …. I’m honestly surprised that at this late stage of release of 1709… after all we’re just about to get the next feature release… and just now Microsoft is fixing an issue whereby modern apps are getting reinstalled after a feature update to 1709 after the admin has removed the app through a process that affectionately refer to as deconsumerizing Windows 10. More observations: Computerworld Woody on Windows. Third time they’ve pulled this “Gawrsh” garbage in the past four months. While everyone else is wanting to keep 1709 at bay, I was wanting to get it to install on a small 32 gig hard drive. I had previously tried a usb flash drive, purchased and installed a SD card and neither one worked. A good (geek) friend of mind recommended that I try using an external usb hard drive during the feature install process. I initially said to him that I had already used a flash drive and he kindly pointed out that he didn’t say to use a flash drive, he said to use an external USB hard drive. While everyone historically swears that external usb powered hard drives and flash drives are the same, clearly in this feature release update process it’s not. When I was attempting to use either the flash drive or the SD card, I would get to a point in the install process where it would say I didn’t have enough room and I would have to prompt the system to use these devices. When it would attempt to use them, it would fail and roll back the install. When I used the usb external hard drive, it never prompted me for the need for additional storage. After installing the update it immediately began properly installing unlike all of the previous sessions where it would stop and roll back. The moral of this story? 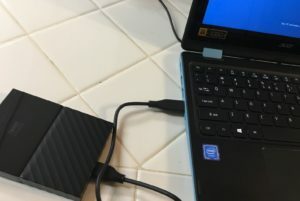 If you are like me and you DO want 1709 to install, you have a hard drive tight on space and you are having issues, go get a usb external hard drive and see if that does the trick. 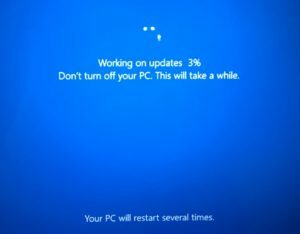 More than a few people have asked, what with Win10 1703’s new-found ability to upgrade to 1709 all by itself — no Windows Update required — what does it take to make sure Microsoft doesn’t change its mind again and pushes you onto whatever version it likes? which seems to be a whole lot of work just to stay with what you have.